One of our students is busy drawing the face of a little boy. 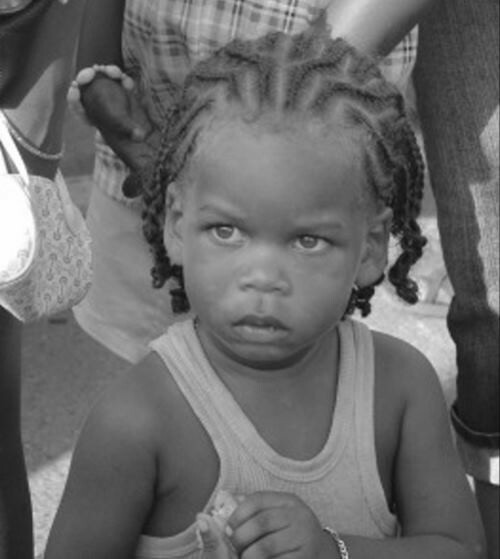 The boy’s hair is plaited into cornrows. Val asks how to draw these cornrows correctly. Drawing cornrows and dreadlocks must be one of the parts of drawing faces and portraits that people avoid like the plague because they simply don’t know how. 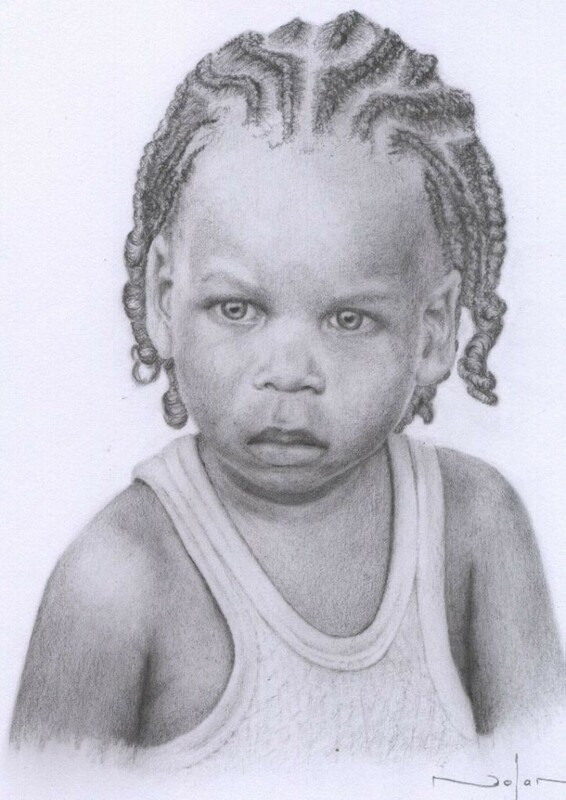 Yet drawing cornrows and dreadlocks is really not that difficult. 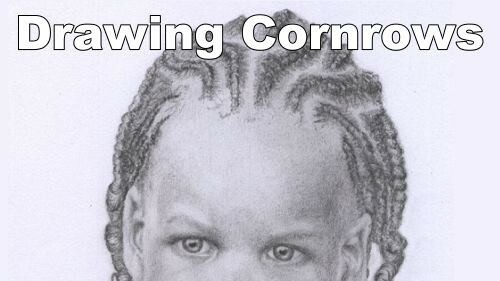 There are three steps that we need to follow when drawing cornrows. Before we can start to draw the little boy’s hair we need to know what it looks like from up close. As you can see the cornrows are nothing more than a series a plaits that form a pattern on the head. 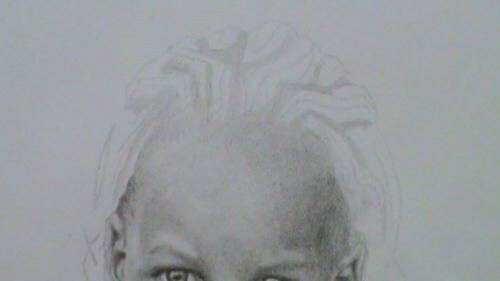 When hair is plaited we get three distinct areas that we need to draw. The first is the exposed scalp. Because the head is round we need to continue the shading of the skin in these areas. We will then get highlighted and shadowed areas corresponding to the same tones we have used in the face. 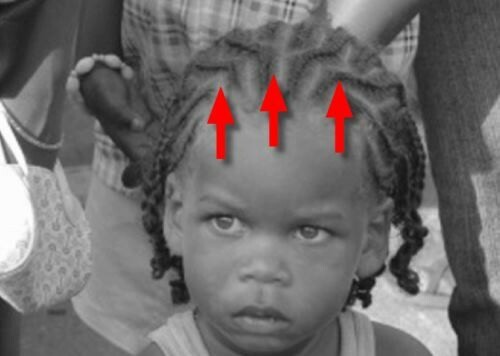 Then there are the areas between the exposed scalp and the cornrow. In this areas the hair is pulled towards the plait and lies flat against the scalp. Looking closely we see that the individual strands of hair converge where they meet the plait. We then get a series of these converging areas of hair strands we need to show in our drawing if the hair is going to look realistic on the face. 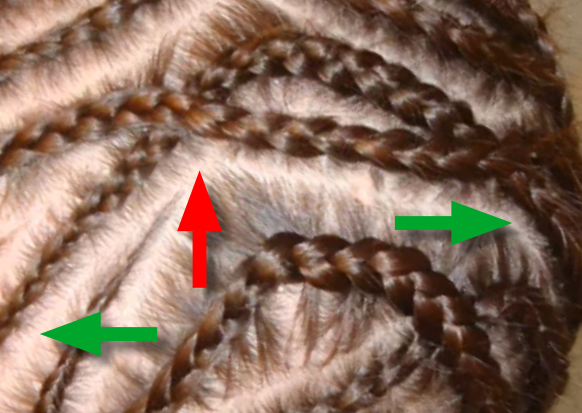 It is very important to draw these strands of hair in the correct directions to not only show the gathering / converging effect, but also the shape of the head – remember that these hairs lay flat against the head. That means these lines will follow the shape of the head. Lastly we have the plait itself. Drawing the plait is a series of shadings from light to dark, almost like a multitude of tiny mountains. The peaks catch the sun, the valleys are in shadow. As the plait itself now forms a height off the head, we often find that each plait (as a whole) casts it’s own shadow the the head because of this height. Clearly visible, so we will need to draw them in. Luckily for us though the photo has been taken at a distance, so we will only need to suggest these details on our face as opposed the drawing them in strand for strand. I have drawn in the outlines where the scalp is exposed as well as the outlines of the cornrows using a 2H pencil. This means I end up with a maze of lines and will have to be very careful to not get confused when drawing. I do this by pointing at the area of the hair on the reference photo that I am currently drawing with my left hand and then drawing the same area with my right hand. Moving both along as I progress. Drawing from bottom to top (scalp, strands then cornrows) as usual. 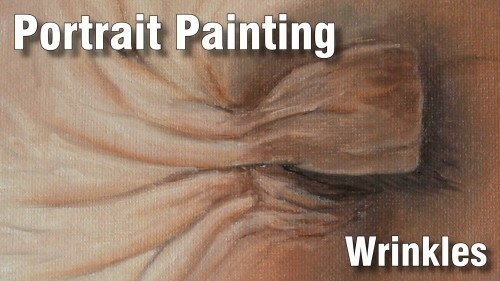 I start by shading in the areas of exposed scalp using the 2H pencil. 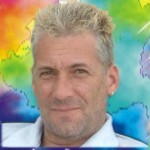 Here we have to ensure the scalp colour / shade starts off exactly the same as the corresponding forehead colour / shade. It would then change as the head rounds towards the back. Sometimes you have to look very carefully to see the correct shade between the darker surrounding hair. In this drawing the sun is coming from our left so the scalp is lighter on the left of the face and darker on the right hand side of the face. With the scalp shaded in it becomes easier to see what goes where. Next up are the pulled strands of hair. 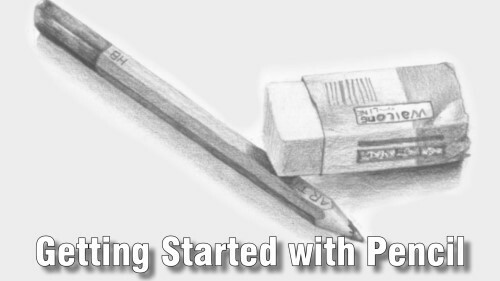 Staying with the 2H pencil. I use a short flicking motion from the root to the tip of the hair. Remember that the individual strands of hair converge as they meet the cornrow so do the same with your flicks. By doing this you will already start to get a feel for the edges of the plaits. 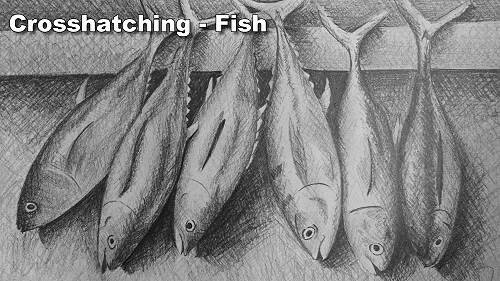 I started by drawing my flicks in lightly to get a feel for them and to get myself into a rhythm. As I have many cornrows to go, I like to get myself into a rhythm. Things go quicker then. Now we can suggest the cornrow itself. For this I am using a 2B pencil. Starting at the shadow side I scribble in the shadows of the plaits curling them up and over the plait. 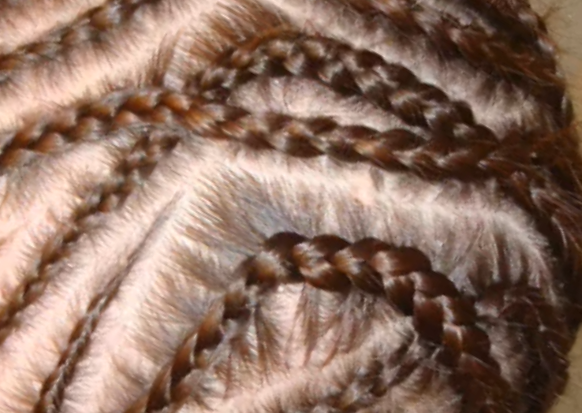 This creates the height of the cornrow. I do the same on the opposite side side of the cornrow, only here I don’t make the shadow as wide. This then creates effect of the cornrow casting a shadow, adding to the effect of height off the face. I am also careful to ensure that I leave some highlight areas on the tops of the cornrow. I then darkened the pulled strands of hair to match the hair colour using my 2B pencil. Now that I have one, it’s a case of rinse and repeat for the rest. 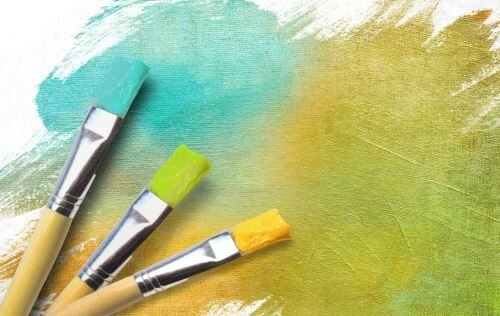 Look out for the directions of the pulled hair, cast shadows as well as the up and over strokes – these will give you the sense of direction as the cornrow contours the face. So as you can see there is a distinct process we need to follow to draw the cornrows correctly, but the process itself is really not that difficult.